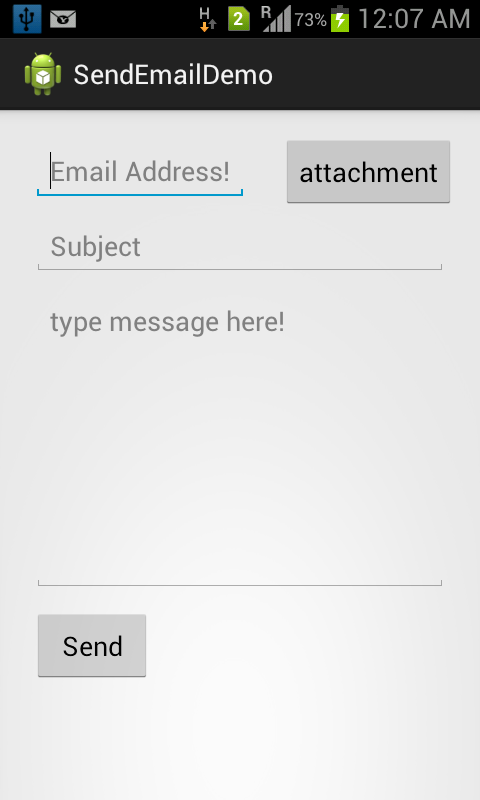 This is a simple demo for send email in Android with attachment. For attachment I am using Intent.ACTION_GET_CONTENT. HI manish have checked with working device the code was not performing any operations on it. It should work dear! I have tested it on many devices. Something wrong I think. Please check permission, package name. Hi manish in this application give me error " No application can perform this action". how to solve it. how to set up internet on the emulator? Hi manish,,, i got an error in mainactivity.java... "activity_main cannot be resolved or is not a field". how to solf it? I think in your project R.java file is not created. please clean and re-build your project. You can't send it directly from sqite. You need to generate report first in pdf or any other format after that you can send as attachment. Sorry dear no idea. Well if you want do that you can use web-service to send your data on server and from there do what you want. Okay I am sending zip code please try to import into your workspace. Hey email is going successfully but without an attachment. can you tell why is this happening? please check your log-cat is there path of image or not? may be your path==null. Sir, i want the zip file. Please copy paste from above it is very simple program. It should work properly. Actually I don't have this code on GIT server. How to add the images into emulator gallery?can you please let me know th esolution? Use DDMS in eclipse. Using DDMS you can put an image into your sdcard. As it shows nullpointer exception its mean your data is null when you trying to get onActivityResult. So use try catch here. And use any other method to get the url of image. Yes sure you can send any type of file. Just pass your URI of your PDF file. And for user Interface you need to implement chooser lib like yahoo mail app using. Hi Manish my name is Arslanali. It is necessary to send a xml file by email. I do not understand how to send a file. You can not find an example of sending a file? Yes sure you can send any type of file. Just pass your URI of image. Hi manish, actually i'm in trouble with my small project, wil you help me with pick / send image to a mail id,(where i have camera interface from where i capture image and captured image should be sent to a particular (fixed) mail id ).. i'm new to android so facing lot of problems hope you eil help..
What if we want to pick image and send by one button only? This is you attach first and send. It should send immediately after attached. Any tutorial? Thank you. Hello Sir, Thnxx a lot.. after making some change, this project i.e. working superb... thank you so so much for such type article.. I really appreciate your effort and salute to you.. Please teach us hoe to capture image and send it to send to ListView as well as choose pic from gallery... thnxx a lot fro such type article again. To display image in listview first you need to store images into local storage or sqlite or any collection. Kindly follow below below url, it will help you using sqlite database to display image in listview. Hello, What if i don't want the user to send the email to anyone but one email address. How do i go about doing that? In case of chooser create new email page will be open and user can send email to anyone.For your requirement you need to use web-service and send email from server to particulate email id. Oh okay. Thank you very much. That is very helpful. How to Attached .doc file. manish can u help me and can i have your gmail id? Are you using emulator or real device? In real device it must open the gallery. It is just because of your Uri is null inside onActivityResult(), its happen because of high resolution image. So try to Google for this issue. Hi Manish! Can you please send me the project in rar file? I really need this one for my school project and I am very new with this one. My email is alvin29jezreel@gmail.com , please consider my request. Thank you sir! Please copy paste from above, I have lost my workspace. getting Error:Content is not allowed in trailing section. I am not sure but user can set default app. Or you can direct open any app using their package name(Intent Filter). you need to do some R&D on it. Android Hub 4 you. Powered by Blogger.